So how well did the Foxconn A79A-S DigitaLife motherboard perform in today's performance review? The Foxconn A79A-S DigitaLife motherboard is an unusual beast that has some great points, but again it has some not-so-great ones at the same time. The Foxconn A79A-S bundle isn't anything to "write home to mum about", but it does provide everything that you'll need to get your system up and running. I guess that I've been spoiled by the vast amount of accessories that you get when you purchase say an ASUS motherboard. You just don't feel like you're getting value for money when you're paying a premium price for a motherboard. 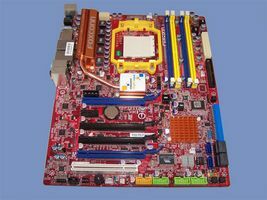 Furthermore, the motherboard colour scheme isn't the best and is quite ugly. The Foxconn A79A-S has probably the best layout of any AM2 motherboard that I have seen to date. The overclocking experience on a Phenom X4 is good thanks to the inclusion of ACC. The extra overclocking headroom made available to you by the Advanced Clock Calibration (ACC) function is certainly a welcome addition, and an unlocked mmultiplier certainly helps too. The Foxconn A79A-S DigitaLife is also extremely stable when overclocking. That being said, I did find the HTT overclocking experience on this motherboard very poor, but it is never usually fantastic with these motherboards anyway. During out trip around the BIOS, I mentioned that it feels extremely 'clunky' in that the processor and memory settings are in completely different areas of the BIOS. This makes adjustments tedious at best, and becomes extremely frustrating at times. On a couple of occasions I found myself just getting up and walking away. Pricing for the Foxconn A79A-S DigitaLife motherboard, unfortunately, is where everything really comes unstuck. Ebuyer have the motherboard advertised for £204.45 inc vat, and further searching didn't yield many better offers. Our Australian readers can get their hands on the A79A-S from Altech Computers for AUS$499 inc GST. For a motherboard at this price point I just feel that it isn't particularly worth the premium that you are having to pay for it. There are better alternatives out there for your hard earned cash.